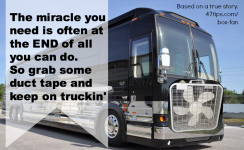 Positive Thinking Tip: The miracle you need is at the end of all you can do, so keep on Truckin’! His name is John. John was traveling with some business guys in a large and very expensive rig. It was important for him to get to a meeting where he was to be the key speaker. However, as they motored along, he realized that the engine temperature was beginning to rise. One of his passengers was concerned that John was going to ruin the engine if he didn’t just pull over and wait for help. John knew plenty about auto repair, but just didn’t have the tools. Also, they were so far from civilization in any direction that to wait for a tow would be simply unacceptable. It would take far too long to get the help, and the tow fee for a rig as big as his was going to be so huge, he didn’t even entertain the idea. He pushed that motorhome along and kept going. John turned to him, weary of his pessimism, and said, “I’m NOT going to stop until I HAVE to!” He hadn’t yet done all that he could do, so in his mind, it wasn’t time to change plans. Instead, he bull-headedly focused on his destination and kept faith that SOMEhow he would find the way to make it to the meeting on time. Then his mind began to think… what did the rig need to stay cool? The engine fan had stopped. It needed air circulation. Well, he had a large box fan, so he used duct tape and fastened it to the front grill of the motorhome, ran the cord through the window, plugged it in, and hiked that final hill. What a picture that must have been to any oncoming traffic! They pulled into a Burger King, and sat at a table contemplating what to do next. They were soon on their way and John accomplished exactly what he had set out to do. Against the odds, they reached the meeting in time. John’s “miracle” was waiting in that town the whole time. He didn’t have to “go the distance” – he actually met the solution half way, by pressing on and having faith that the solution would be at the (true) end of all he could do. That is life. That is how we need to approach all of our problems, be it financial, emotional, spiritual, or social. We must do all we can to get ourselves TO that miracle we seek, and TRUST that THAT is where we will find it. We mustn’t let that final hill, the hardest part discourage us; for after all, ‘there is no witness until AFTER the trial of our faith’. For more on this topic, read The Jackrabbit Factor FREE! Originally posted September 28, 2005. Previous Previous post: Stop the World – I want to Get Off!